Steiff has become an international household name synonymous with the finest toy animals. The company was started as a domestic enterprise in the late 19th century by Margarete Steiff. Margarete Steiff grew up in the small German town of Giengen in the Wurttemberg countryside. Born in 1847 she contracted a fever as a very small child which left her wheel chair bound with a severe weakness to her arms and legs. Nevertheless she was determined and became a skilled seamstress working with her sister, Pauline. In 1868 Margarete opened her own ladies apparel and clothing store. It was around 1880 that she discovered a pattern for an elephant in a fashion magazine and began to make felt elephants stuffed with the finest wool as gifts for adults. They were intended to be used as pin cushions but they delighted the children as much as the adults. They proved very successful and by 1895 the first toys were being shipped from Germany to England. A variety of animals were produced including purring cats, dogs, monkeys and pigs. The first patterns for pull-along toys were produced as early as 1886. That these toys were made with such love and care was readily apparent. Margarete Steiff said “Only the best is good enough for our children” and it was no idle boast. Margarete was joined in the business by her six nephews. Amongst these was Richard Steiff who is credited with designing the first bear. He is said to have been inspired by the playful brown bears in the zoo at Stuttgart whilst studying there. The first bear was made from plush fur with moving flexible arms and legs. The American President, Theodore Roosevelt had a passion for hunting bears. Steiff began importing their toy bears into America during his presidency and they became a symbol of his hunting passions. Theodore was fondly shortened to Teddy. Famously the bear became the Teddy Bear and 12,000 Steiff bears were shipped to America at that time. 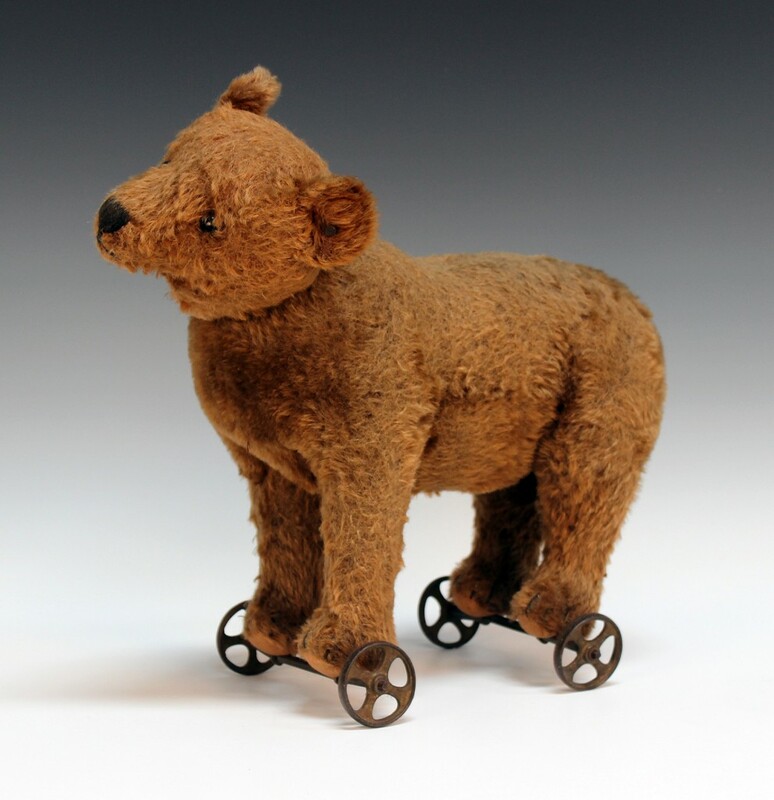 Output and production were severely affected by the two World Wars but today Steiff animals are still being produced and collected. But it is the early Steiff animals which attract the most attention and highest prices. I ask Toovey’s toy specialist, Chris Gale, about this and he explains “The early Steiff animals were handmade so each toy is unique which has great appeal to the collector.” Chris shows me a selection of Steiff animals which to my eye all seem to be rather playworn. 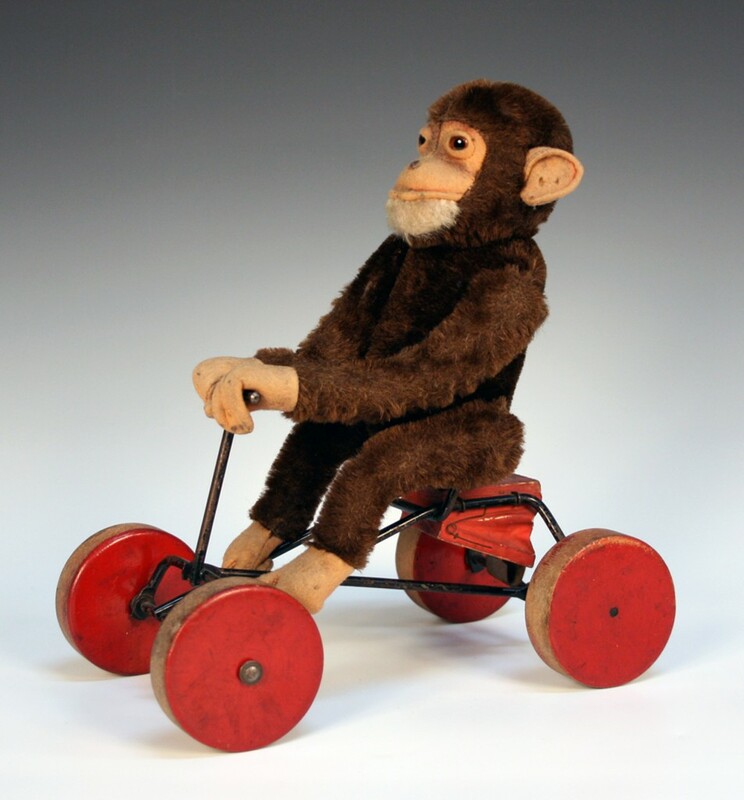 Chris says “There is obviously a premium for toy animals in exceptional condition but they are rare as Margarete Steiff insisted that they be played with!” Amongst the array of Steiff animals sold in Chris’s specialist toy sales is a Steiff mechanical elephant and a Record Peter Monkey which sold for £1000 and £100 respectively. I have to own that my favourites are the bears. 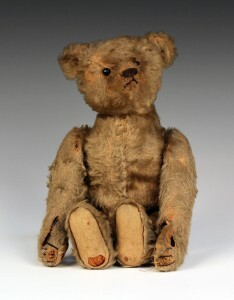 There is real character in the hand stitched face of the seated Steiff teddy bear with his boot button eyes. His fur and pads are worn, a sure sign of having been loved over many years. The Steiff pull-along bear delights with his head sewn at a jaunty angle. Chris tells me that Toovey’s sold them for £500 and £460 respectively. All these Steiff animals would have been made in the first twenty-or-so years of the 20th century and are marked with a Steiff button in the ear. 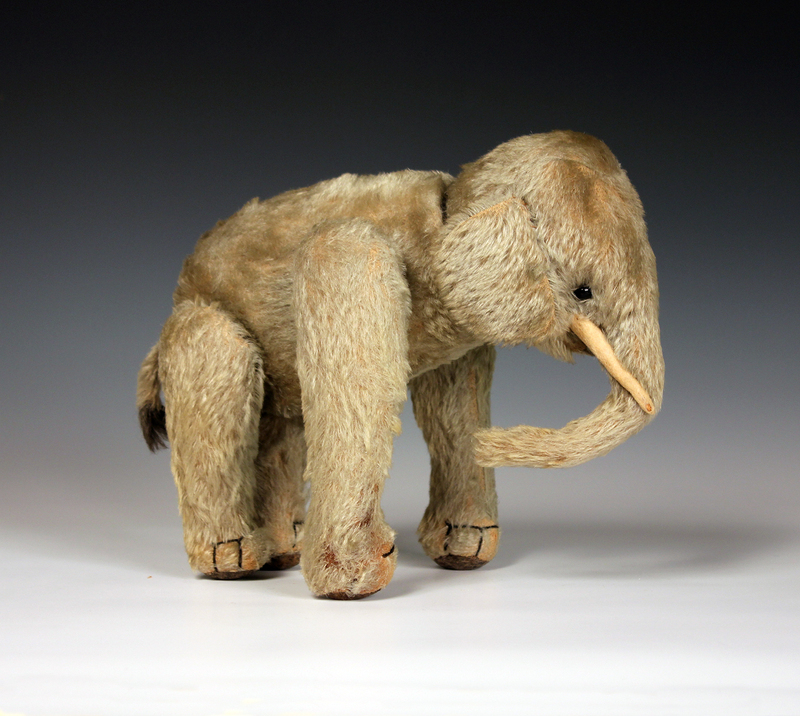 If you are interested in collecting or selling Steiff toy animals Chris Gale is always pleased to offer advice and can be contacted on 01903 891955 or by email at auctions@tooveys.com. By Revd. Rupert Toovey. Originally published on 6th January 2016 in the West Sussex Gazette.